Try using the straight PF Tek man. It rocks. That is two cakes 75% colonized then cased. You cant go wrong with the PF Tek. and Shroom Wizards casing method is pretty cool too. I haven't tried the PF Double ended casing tek yet. I don't have one and can't afford one. As soon I can I will buy one though, but as for now, what can I do? Or is a PC absolutley necessary. Hey melter8or, in your oringinal post you said your friend had the problem So if it's your friends problem why do "YOU" have to worry about buying a pressure cooker, shouldn't that be your "FRIENDS" problem? Just curious. You're not growing are you? Shame on you if you are. tsk tsk tsk! I had the same contam problem with my first (ever) batch. I used (and still use) MMGG, however, I learned that if you boil the jars (do not forget a lid) for 2 hours instead of one you will be just fine. I haven't lost a single jar to contams after doing this. Also, every time I inject a bit of spores I wipe the needle with a bit of cotton soaked in rubbing alcohol. you should really consider using Uncle lazlo's Mycelium tek (see grow/find). 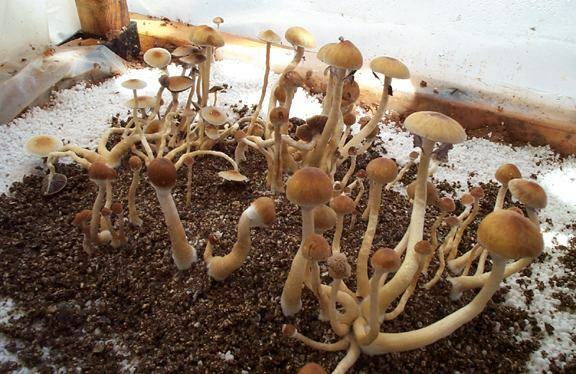 By using mycelium you can soak the whole thing in H2O2 + the mycelium will start growing much faster. you cant afford a pressure cooker? wtf they are dirt cheap! you can get a brand name new one for around 20$ which will do 8 1/2 pt jars..
look on ebay.. look at junk stores, you can get one for even less.. I see pressure cookers all the time for about $2 at the Sally Anne. I've even been thinking of stocking up on them but they are so cheap new it wouldn't be worth it! A friend of mine recently got a bunch of PF syringes. Only 1 jar colonized fully without stalling. Several never germinated. He used the exact same method as they did with Hawk's Eye syringes, where he had 100% success with full colonization. I've heard a lot of good things about PF though. Maybe this was just a weak batch or whatever. That's just the facts as my friend sees them. I was EXTREMELY dissapointed in my last syringe from PF. All the friuts except 1 were sterile, no spores I didn't even bother keeping that print figuring the resulting friuts would be just as worthless. I have heard alot of bad press about PF lately.. i wonder if his strain is starting to show extreme signs of mutation..
1/2 pint jars of finch seed/verm cut in 1/2.. cased with the 50/50+ mix.. the strain is the cambodian cubensis. Perhaps its time to upgrade that strain your working with. Isn't it funny that all our friends are using us, in a very nasty brutal way. No Pressure Cooker to sterilize jars what to do? 918 topic views. 21 members, 85 guests and 14 web crawlers are browsing this forum.